Sometimes I just feel like talking, and guess what? I have a blog! So I can talk with my fingers! You can read my thoughts! Lucky YOU! I have a lot of mismatched socks, and A LOT of yard work, and there’s never enough coffee but I also have a steady stream of superhero sightings and I might have just purchased a pair of glamorous silver flip flops for $2.50. I’m realizing my life has a giant smattering of random. This makes me happy. I love random. I love surprises. I love making the bed with the kids toys still on Derrick’s side. He tries to tumble into bed, but he is ruthlessly stabbed by four matchbox cars and a slinky. HA! I laugh every time. I don’t love the face-whacks. In my life there’s Disney, because Disney owns pretty much everything on the planet and I cannot escape. I’m always being pointed at by someone, in this moment it’s Shel, who is riding a toy car, holding his MeMe, and chewing, all at the same time. He’s actually chewing and yelling, because he wants to take a picture with my camera. Batman would want to take a picture with my camera too, but he’s busy solving the world’s mysteries with a Mouse-ka-tool. If you don’t know what that is, I can’t help you. It defies explanation. I wish I took better photos, but I also wish I could Bowl better than Derrick. Neither of those things are ever going to happen, so let’s get past the blurriness and analyze what’s really happening. 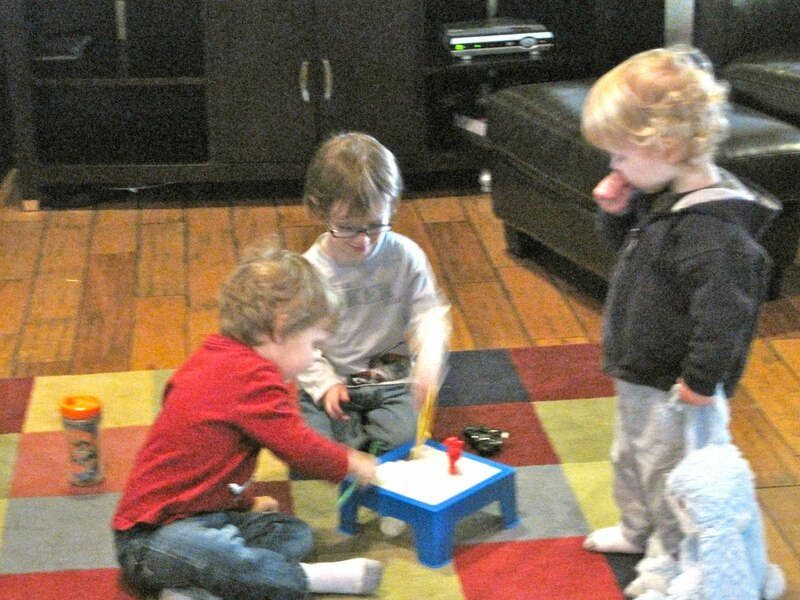 There’s an intense “Don’t Break the Ice” Tournament going on here, and OF COURSE I gave three year old boys small plastic hammers. OF COURSE! You can tell it’s an intense game by the posture of Sheldon, who is sucking his thumb and concentrating very hard. He has his money on Q. By “money” I mean “goldfish crackers”. Side note: The colorful rug in the “Don’t Break the Ice” pic is not included in the Batman and Mickey Mouse picture. I need to borrow your steam vac Kayla. I don’t think Kayla reads my blog. Rats. While we’re taking a close look at photos which define my life, let’s talk pine cones. I have a lot of pine cones. This is one barrel full, and I have three more just like it, not including the one I cleaned out and planted flowers in. When we first looked at this house, I saw the barrels full of pine cones and I ALMOST said, “Oh, just what I always wanted! A barrel of pine cones!”, but I didn’t. It turned out that the current owner of the house was standing right next to me. I’m glad I didn’t say anything, what if these are the product of months and years of serious pine cone collecting on his part? Our new house has a lot of trees. There are trees that drop pokey balls, trees that drop fluffy globs of pollen, trees that drop teeny tiny seeds and birch tree caterpillar seed things, and there are trees that drop pine needles and pine cones, and almost all of them drop leaves. a) I don’t really sweep it every day I just feel like I should be sweeping the path every day. It’s yard work guilt. This is probably the weirdest post I’ve written, but to make up for it I’ll leave you with a picture of an adorable cowboy. Life is so real and so is this post. I think like this too. Is there any other way to decide which hand soap to buy? I even have hand soap in Christmas packaging for when it's time to deck the halls. Or my bathrooms. My leaf blower hates me. I wrote a post about it. I love your randomness. And you. Hugs. I have a bag of handsoap I recently received as a gift on my bedside table… because if I put it in a bathroom, someone will use it. I'm pretty sure this is not normal. I am with you on the hand soap. My husband comes home with stuff that's blue. With fish on it. For our kitchen that is not blue or fishy. “It was on sale!” he cries. “It doesn't match,” I moan. So I buy the hand soap. Naturally. You may have inspired me to do a random post b/c it has just been that type of a week. I love Justin Timberlake. He's kind of a man whore though, and I'm married and all, so I don't think it would work out. Is there anything in life that isn't crazy random when you are parenting littles? If your thought life is tidy than you for sure aren't a fun mommy. random is the best way to roll. I buy books because of the cover and I haven't been disappointed yet. And not the kind with half naked couples either! Oh, and I want twelvedaysold's socks. Cool. Oh yeah, baby. I love me some random J-Hu. Your kids sure are cute, Lady. I don't believe that they are as *wiley* as you make them out to be. Also, Silas just discovered Don't Break the Ice at his cousins house last week. It was nearly impossible to rip the plastic hammer from his grubby mitts. um, i've actually always wanted a barrel of pinecones. they smell like heaven! and also pine trees. but mostly heaven! ps i cannot believe you are forcing me to resort to wikipedia on this mouse-ka-tool thing. pps you're my favorite kind of random. Kayla? Kayla? Is Kayla here? You can borrow the steam vac. And Adam will have to show Derrick how to use the leaf blower. Or Derrick can look up the manual online and figure it out. I'm so glad Kayla showed up. I was just going to call her. Ok, not really, I don't know Kayla, but she seems to lend and give great home appliances so I think she sounds like a pretty handy, I mean special, friend. Yay, random. I love random rambles.